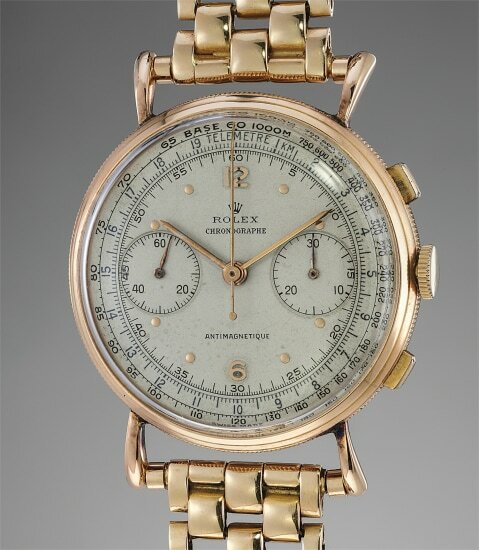 The Rolex chronograph reference 4062 was produced from 1942 until approximately 1963. The model was cased in a variety of metals, ranging from yellow gold, pink gold, stainless steel, to stainless steel and gold combinations. The reference features a ribbed band as well as elongated tear drop lugs, giving the watch a very distinctive appearance that made the reference famous amongst collectors. Square pushers further complement the thin and elegant case. Along with the snap on caseback, the square pushers were soon to be replaced in order to increase the waterproofness of the watches. In overall excellent condition, the present watch still retains its extremely delicate and thin crown as well as the case number engraved on the caseback. The dial features the desirable multi scale and the designation “Antimagnetique” on the lower part of the dial. This distinctive combination is further complemented by a Rolex rice-grain bracelet made by Gay Frères giving the timepiece a timeless elegance. The present lot stands out from Rolex’s traditional production and will speak to the collector looking for a vintage “dress” chronograph of tasteful restraint and refinement.